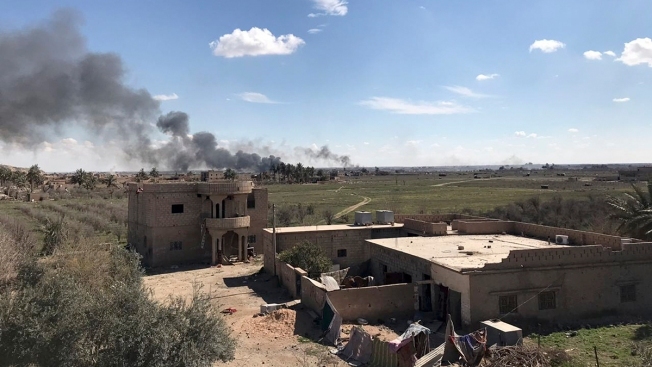 Columns of black smoke rise from the last small piece of territory held by Islamic State militants as U.S. backed fighters pound the area with artillery fire and occasional airstrikes, as seen from outside Baghouz, Syria, Sunday, March 3, 2019. Commanders of a U.S.-backed Syrian force fighting the Islamic State group in Syria say intense fighting is taking place as fighters advance toward the last piece of territory held by the extremists. Islamic State militants are desperately fighting to hang on to the last tiny piece of territory they hold on the riverside in eastern Syria, deploying snipers, guided missiles and surprise tunnel attacks. The resistance prompted a fierce pounding Sunday by the U.S-led coalition and its ground allies in their final push to end the extremist group's territorial hold. Rings of black smoke billowed over the besieged speck of land still controlled by the group in the village of Baghouz, after airstrikes hit several targets. 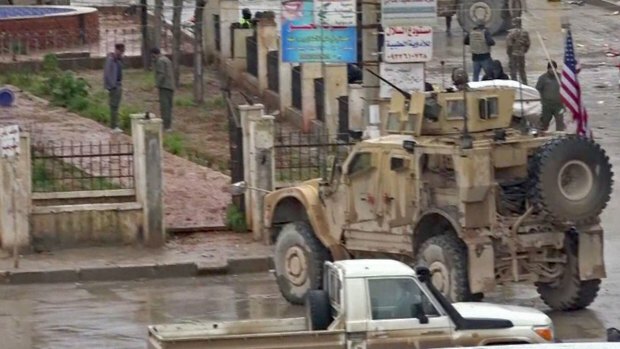 The U.S.-backed force known as the Syrian Democratic Forces resumed an offensive to recapture the area in Baghouz on Friday night, after a two-week pause to allow for the evacuation of civilians from the area. Retaking the sliver of land would be a milestone in the devastating four-year campaign to end ISIS' self-proclaimed Islamic caliphate that once straddled vast territory across Syria and Iraq. The group continues to be a threat, however, with sleeper cells in scattered desert pockets along the porous border between the two countries. SDF commanders estimate that hundreds of fighters remain in Baghouz, taking cover in tunnels and trenches. A senior SDF commander described the militants as "rats" but acknowledged that they're still fighting to the bitter end. Commander Akeed, who leads one of the main fronts in the last battle against ISIS, said the militants are sticking to their trademark techniques, carrying out swift attacks without aiming to hold ground but laying the area with mines to increase casualties. They also deploy "inghimasiyoun," a term that the group uses to refer to infiltrators who enter areas behind their enemies' lines, in a bid to take hostages. Early Sunday, one of Akeed's units came under attack from a group of 10 ISIS militants, including four women who emerged from a tunnel but were met with fire. At least two militants died but the rest escaped, he said. "They have said they will engage and won't leave," Akeed told The Associated Press from his position, hundreds of meters from a very noisy front line. "They are strong enemies but they are besieged from three fronts. What could they do? Attack to prove themselves." What appears to be a major weapons depot was targeted Saturday in the opening salvo of a ground assault on the tent encampment and parts of the villages still in ISIS hands. On Sunday, airstrikes continued to hit the depot, as fire raged for more than 24 hours and ignited ammunition flew in the air. Other airstrikes hit another mortar depot on the other edge of the tent encampment, which days ago was full of residents before they were evacuated ahead of the military assault. A third hit a building where a sniper was taking cover. Sefqan, another SDF commander who leads a special forces unit that advanced into Baghouz Saturday night, said the targeted weapon depot appeared to be a major one for the militants. He said the airstrikes continued to target the two-floor depot to keep the militants away from whatever remains there. SDF fighters tightened the noose on the militants Saturday, advancing from two fronts, and cutting off their access to the river that abuts their last territory from two sides. Mustafa Bali, the SDF spokesman, said coalition airstrikes destroyed several car bombs during the past two days of battle in Baghouz. In a tweet, he said three car bombs that were trying to hit SDF positions were destroyed. President Donald Trump's National Security Adviser, John Bolton, described the territory ISIS holds as an "insignificant piece of real estate." Asked in an interview with CNN whether ISIS has been defeated in "100 percent of the land" in Syria, as Trump had asserted earlier this week, he said: "It will happen very, very soon." The global fight against the Islamic State group is one conflict in a country that has been at civil war for nearly eight years. Near the northwestern province of Idlib, a Syrian jihadist group linked to al-Qaida killed 21 Syrian soldiers and allied militiamen, in one of the most serious violations of a months-old truce in the area, according to activists and a Syria war monitor. Sunday's attack by Ansar al-Tawhid fighters was carried out in the village of Massasneh in the north of Hama province, according to the Britain-based Syrian Observatory for Human Rights. 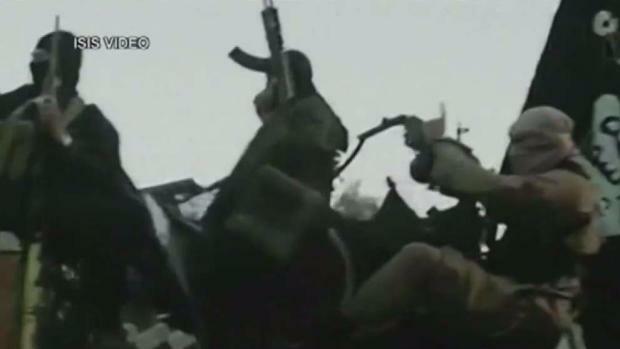 A statement by the Syrian Foreign Ministry confirmed the attack, saying "terrorist groups" launched a pre-planned attack on armed forces stationed along the main road of Massasneh, killing and wounding a number of soldiers. "Syria confirms the full readiness and integrity of the Syrian army in dealing with these crimes and violations," the statement added.